I’ve been feeling a bit like a hippie lately. I drive an electric car, my wife and I have a decent-sized garden, we practice the “if it’s yellow, let it mellow; if it’s brown, flush it down” rule to try and conserve water in our toilet, we don’t water our lawn in the summer, and now we have a rain barrel! Note the master craftsmanship of the gutter not extending all the way down. If it’s going to rain this much, I might as well take advantage, right? 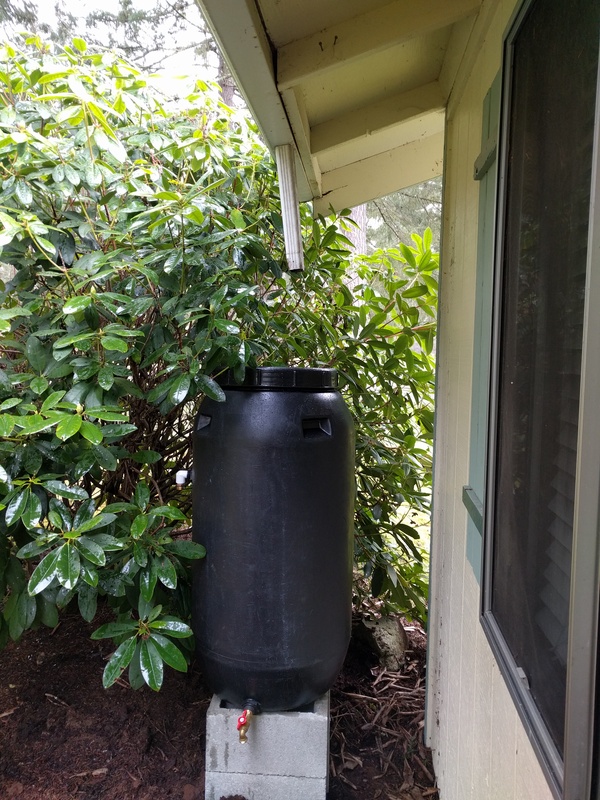 I’ve seen the rain barrel guy at farmer’s markets and other events since we moved to Tacoma and I always thought it’d be cool to own one, so I finally bit the bullet and spent $90 on one from Natural Rainwater. Thanks to our giant rhododendron, you can’t even see the barrel. Four cinder blocks later and it is installed – though it’s a bit homeowner grade as my brother would say. I need to get a longer downspout from the roof so it’s better connected, but it’ll do for now. Veronica is a light sleeper and this is outside of our bedroom window, so she’s not too fired up about the chance of listening to dripping water all night, so eventually I want to connect a longer pipe to it. I’m also curious to see how fast it fills up. 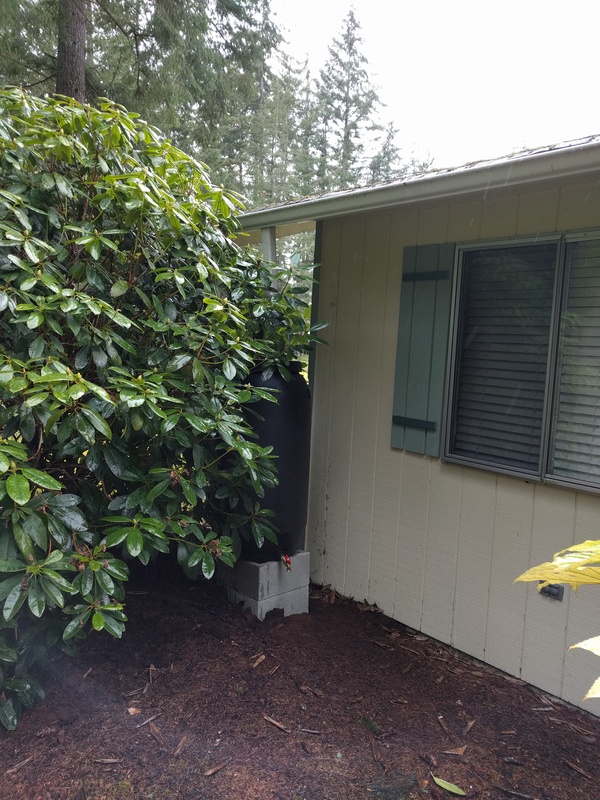 I imagine in the winter it will fill up and I won’t really have anything to use it on, but that downspout wasn’t built properly and was just sending water onto our foundation, so at the very least I can help move the water out into the yard. 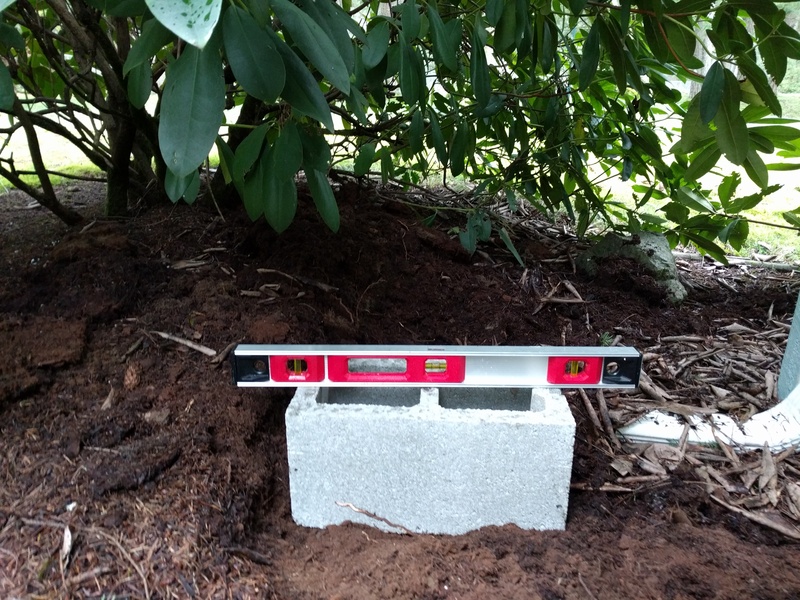 Four cinder blocks is all you need to install this bad boy. Pretty easy. Maybe we’ll get a bunch of houseplants and we can use the water for those in the winter? Or we could go old school and flush the toilet using the water – I remember using that method in Romania when I visited in 1994. I’m also a bit worried about creating a mosquito haven in the summer, but frankly we already have a ton of mosquitos, so why not add more to the mix? There is a pretty big mound here from years of pine needles falling in this area, so I had to do some major construction. Anyway, I’m not sure what is next on the hippie checklist, though. Perhaps composting? Sewing patches on clothing? Learning how to play the guitar? Compost. I think the answer is compost. Maybe next year. Good job you two. I like it!!!!! 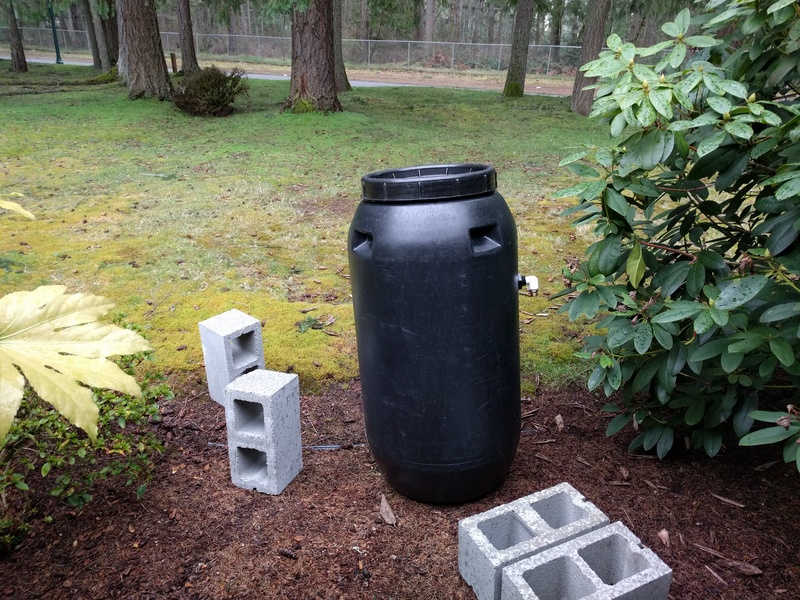 *From:* Traveling the PNW [mailto:comment-reply@wordpress.com] *Sent:* Sunday, March 5, 2017 9:49 AM *To:* rjcraker@nwdistrict.org *Subject:* [New post] I bought a rain barrel, am I a hippie?